OMG Posters! » Archive Landland's Bon Iver Tour Poster (Onsale Info) - OMG Posters! 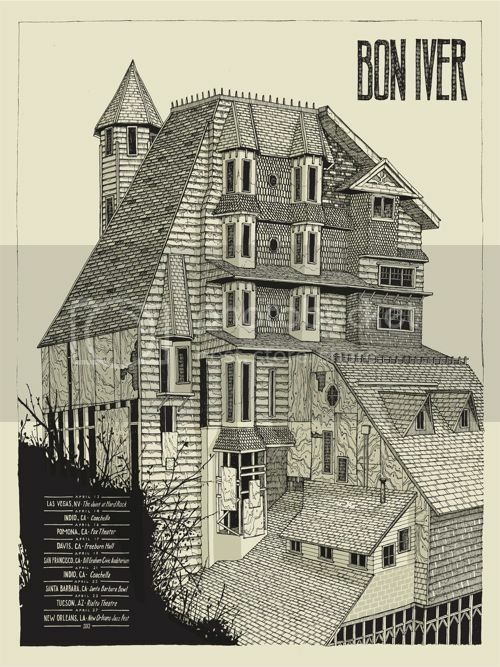 Landland will sell their new tour poster for Bon Iver later today. It’s an 18″ x 24″ screenprint, has an artist edition of 110, and will cost $30. Check out this shot of Dan’s ink drawing…easily some of his best linework yet. They go up today (Monday, April 30th) at 12pm Central Time. Visit Landland.net. Just saw them at Jazz Fest in New Orleans on Friday so this is an absolute must for me! That line work is insane. That dude is either a genius, or a tweeker. How sweet is that little “Availability” status bar in their shop? I bought one at the show in Pomona. It is seriously intense. Damn that’s nice. Also a lot of nice work on their site. I can’t believe I’ve never visited their site before. Jesus, Dan, that is amazing. You never cease to raise the bar. Thanks for all the nice posts, guys. Really meant a lot to us to have people picking this thing up today. Truly an outstanding poster. I love watching great artists one-up themselves with every release. The two preceding commentors should submit work to TeeFury; the sooner, the better.